We interupt this blog for a bout of flu. I have whatever my youngest has. It came on yesterday morning. I had promised a journalist that I would look at her first chapter and synopsis and thus I sort of held it together to do that. Can I just say that I hate being ill? My husband says that I am a very difficult patient. But I am drinking fluids, resting. Doing BRaTY and hoping my temp goes down. Once I am well, normal service or what passes for normal, will resume. My daughter got her GCSEs today. Relief all around as she did very well indeed. One of the things that I think helped in both of my children's foreign language results was the Rosetta Stone language programme. It is excellent and did give the added tuition. When you compare the cost of the programme v the cost of private tuition, it works out much cheaper. Anyway, rather than waiting for my youngest to get in trouble, he has already started working on the Spanish version. 10 minutes or so per day and then he can play computer games. Each of my children though took a different foreign language! My eldest is now firmly of the opinion that studying does work and is the secret to exam success. He also keeps warning my daughter that you have to start studying for A levels from the word go. They are a huge step up and more is expected of you. Right now, I think she is just enjoying the kudos that comes with exam success. The stress levels in the house have gone right down! One Note is the notebook programme for Microsoft Office. You can find it in the Office tools if it is not immediately visible. Like all Microsoft products, there is a tutorial and it is really designed for corporate team work. You can even create a shared notebook -- one where people edit at the same time and all shared notebooks are updated. This might be a good application if authors are working on a continuity for example, as then the Bible of the series is quickly updated. You can even do it as a live sharing session. Just do not ask me how to do it. It is in the tutorial! I have not done a continuity -- they sound like hard work, but I do have to create bibles for my linked books, rather than just relying on memory. A shared notebook as well as linked notebooks has a certain appeal. You can also create notebooks for different books, create tables, and etc. Everything is importable to Word. You can paste pictures, draw and have a variety of different notes. You can also capture webpages, clip pictures etc. SO if you wanted to make a virtual collage, you could do it. You can do lasso select to draw over pictures, and it does have a text recognition feature. You could create a notebook for each story, plus have a master notebook for the series. In some ways the storage system for notebooks is better than creating word files as you can have tabs etc. But like anything, it is just a tool and the main thing is to write the story. Anyway, I suspect I shall use it. Yesterday, my lovely editor sent through my cover for The Viking's Captive Princess. It is wonderful and I think the lovely Judy York who did the cover Taken by the Viking and A Noble Captive also did this cover. I hadn't realised until yesterday that she did ANC. Personally I think the inside front cover of ANC deserves its own front cover! Please bear with me on this. It is called admin. And yes, I am a tad overexcited, but the cover has a great feel about it, much better than VWUW. My youngest is better and no longer as pale. The whole BRaTY thing seems to have worked. He did refuse the rice though. Right back to writing this book. It is the first of a trilogy so you can see why I thinking about bibles and shared notebooks as I want the continuity there. Had I had such things with the Viken trilogy, certain things might not have taken so long...Live and learn. But I am so pleased that Isabel Swift shared her insight gained from being Nora's editor! Sometimes there are things you know you should do but forget. Then you are drowning and someone points it out. In this case, Isabel Swift came up with a practical solution to my problem of naming two characters the same. Keep a master list using a contacts programme. It can be simple or complex but can include little details like birthdays etc. Because after all to me, they are real people. When Isabel makes a suggestion, I listen. After all the woman is one of the legendary editors. And in this case the suggestion is spot on. And I thank her very much. It is even more appropriate because the ms waiting for my editor's thoughts is linked to CMM and so there are overlapping characters. In fact, the second book takes place about the time the first book is ending. Then my current work in progress is the first of three books. I really want to write the last one, but in order for it to make sense, the other two have to be properly done. And I am going to Istanbul at the end of October in order to do research for the last book! Anyway, the One Note feature on Microsoft Office is the perfect place to do this contacts list. It is a bit like having a series of notebooks. You can also create tables etc. So master lists here I come. It would have helped if I had thought of it before...And yes, I know Anne McAllister, about the spread sheet of ultimate power...but I had avoided doing it. We have new ducklings. They have a white mother duck and have gone into the apex. The black mother duck and her bigger ducklings are now occupying the oldest duck house. This season's original white mother duck and her remaining duckling who has fledged are in the middle duck house or possibly the apex. What I don't want is mother duck wars as I am now convinced that the several ducklings were lost because of fighting mother ducks! And finally there are certain aspects of motherhood I loathe -- early morning vomit ranking up there. I deal with it but do not like it. Sigh. There are reasons why I never took up nursing. I think it is food poisoning and thus am going with BRTY -- Banana, rice, tea and yogurt to soothe the stomach. The copy edits/author alterations for Compromising Miss Milton are done. I do try very hard to get it right and to notice things. I have started keeping lists of named characters so that I do not make a mistake and give two characters the same name. Been there, did that and had the alert copy editor spot it. Copy edits/AAs are hard. You have to concentrate. I use a ruler to make me focus on the individual line rather than on the story and so it goes quicker. But I did have to look up the correct spelling of carcass. It is not carcase. Now all I have to do is to wait for the revisions of the ms I turned in at the end of July and to write the next one before the end of October. I need to update my website and get the excerpts on there. The idiotic Land Rover driver who sent my daughter and I diving for a ditch when we were out walking the puppies the other week has had the inevitable crash. He managed to lose control on the bend this morning and took out three parked cars further down the bank. I am only grateful that no one was hurt and that he avoided smashing into our wall. I suspect the ram raider bollards might have had something to do with that. It is funny how some people are happy to smash into brick walls but not ram raider bollards where they know they will do damage to their car. I do feel sorry for the owners of the now totalled vehicles. The Land Rover was not in very good shape either and was towed. Perhaps he will drive a bit more cautiously now. My CP, Donna Alward has just read Outliers which she says is very good. It is one of the recent crop of books that asks what is talent and does talent have to be honed. The answer tends to be yes and it takes many hours. The question for most people is do they want to spend the time and are they honing the right skills. There remains a persistent story, probably enhanced by the film Amadeus that Mozart just was. Nothing can be further from the truth. Mozart practiced. At first his father worked him hard, and then he worked. It was how he supported his family. Mozart was that good because he put the time and effort in. He also loved music. If you look at any of the top athletes, they do practice their skills. They probably practice them more than anyone. The great Australian cricketer and possibly the greatest cricketer ever, Don Bradman famously played for hours as child hitting a golf ball with a stick. He did it because it was fun. Or if you look at dancers, the amount of time someone like Twyla Tharp spends in dance class etc. As she said in her book, The Creative Habit the top ballerinas spend more time at the barre than anyone else. If you read Blake Snyder, you will see that the top film moguls know movies inside and out and still love them. Get a group of writers together and what do they discuss -- writing. The top authors do spend lots and lots of time working. Successful authors read and have read since childhood, absorbing the love of words. Many have written and scribbled away. Nora Roberts' work habits are legendary. Some say without practice, talent is latent and asleep. With practice, talent blossom. Like anything, it is a matter of using it. It is also a small matter choosing the right bits to hone. This does go back to the whole being willing to listen. People who succeed have honed the right skills. I need to remember this and not to keep practising and polishing the same thing but to honestly look at what can be improved and see how I can go about it. Yesterday, the power went out in the village and stayed out, finally coming back on about 9:15 pm, a full 9 1/2 hours after it went. Something to do with overhead cables. It was annoying for my eldest as it was A levels day and he had not topped up his phone. Eventually he was able to discover how his friends had done etc. We did go out to lunch (the General Havelock has a backup generator) and celebrated his getting into university. He did it, and did it well. Now, it is my middle's GCSE anxiety as those results are next week. I had thought when I had my three children that the spacing, particularly with regards to school was good...I had not fully understood the stress of exams! Joanne Rock has a lovely post up at Tote Bags about storytelling. She happened to mention Goodnight Moon. Immediately the first few words of the story entered my head. One of my aunts sent me the book as a board book back when my eldest was a baby. I spent many hours reading it aloud to all three of mine. I was very fortunate with my aunts as they could always be counted on to give books when I was growing up. And they were generally the sort of books I wanted to read as opposed to the improving tomes that other relations occassionally gave. I am not sure if people give books to children as much. I know that I do. It is one of the great joys of having nieces that are younger than mine, I can give books that my lot loved. I know I am glad that my aunts gave books. When in doubt give a book. The weekend newspapers were all full of reports about A levels etc. After ignoring the impending date for the results (this Thursday), I find myself sucked into worry. It was far easier when I was going through it myself rather than worrying as a parent. At least then I knew how much I had studied and whether or not I had answered the questions correctly. There were things I could control. The added complication this year is that there have been many more applicants and those who do not make the grades required, will not necessarily find a place through the clearing system. The die is cast and the result is on Thursday. There is nothing practical or useful I can do, except support. Hardy is doing well with his fetching. He is marginally less obssessive complusive about it than his sister. The amount they both have grown over the last week is staggering. Puppies do not stay little for long. Nor for that matter do children. My younger two proved more than able in eviction yesterday when a homing pigeon invaded my youngest bedroom. I know his bedroom is messy but draw the line at it becoming a pigeon loft. My youngest understood after seeing the poop. He went and got the fishing net we use for the ducks. The pigeon evaded the net several times, knocking over a few models but in the end made a dart for the open window. The pigeon, having been evicted, did try to get back in. Windows were shut. It has now departed and hopefully will once again be in the proper pigeon loft. Today, there should be a post up at Unusual Historicals about Viking manliness and the Viking saga The List of Rig. I have also done a post on a common aspirational author mistake -- Not Hearing Advice. Here it continues to be the usual chaos and confusion that is the start of any novel. We have three duck houses. They are all in the duck pen. The two mother ducks were generally going in the apex house. They had squabbled a bit but no matter. Then they switched to the oldest duck house. Again no real problem. Last night, the white mother duck and her remaining duckling were undecided and had stayed out. A fact neither my youngest nor I realised until Tess discovered her. The other grown up ducks were in the pen at this point and we were only trying to get a few of the Drones Club in the middle duck house. The Mother duck then decided that she was going to go in the middle house which also houses most of the grown up ducks. Cue general mayhem as all the ducks exit that house. All the other houses had to be opened and it became a free for all as the ducks milled about. Tess and Hardy (who were thankfully on leads) became excited and thought this a wonderful event. Cue more mayhem and cacophony of quacks and barks. And it was a game of once more around the duck house, my friends. In the end, the white mother duck and her duckling got her way. They passed the night in the middle duck house. Three fully paid up members of the Drones Club had to be captured individually with the net and placed in the apex house. The puppies could not understand why a netted duck was not there for their amusement. The entire operation took forty five minutes. NOrmal duck putting away = five minutes! As Liz F asked, I have included pictures of Tess and this morning's meeting of The Drones Club. I have now finished reading 38 Common Mistakes in Fiction Writing. The book has been around since 1992 and has sound advice. Most of it any writer (published or unpublished) will have heard before. There again, as Bickham points out -- sometimes you do not hear what the teacher is telling you. Sometimes you can not understand what the editor is saying. Then suddenly, a light bulb happens and you think ah yes, this was she was saying xyz. It is also why it pays to read a wide range of craft books because explanations can differ, even if they are saying the same thing. He does make the point that with craft books, they cover a wide scope and it is impossible to say -- if the specific exercise is something you need to work on or if you are merely drawn to it because you actually avoiding looking at other areas of your work. (This is where a critique partner can help). He also points out that not every teacher works for every pupil. You have to be willing to learn and to apply that knowledge. It is not simply having the tools but knowing which tool to use in which situation. Anyway, it is a sound little book full of helpful advice, if you are willing to listen and absorb it. It is aimed at the commercial fiction writer rather than the literary one, and not necessarily the romance genre. But somethings apply across the board. His plan for revision very much mirrors the one I currently use but he makes some good points about what to look for. To my mind the first one -- writers write and the last two -- persistence pays and start now are the most important lessons. And right now, as my cp has been cracking her whip, I need to write. 31 October is not really that long away. The puppies are doing well, in case anyone is interested. They are starting to be very helpful with rounding up the ducks at night. Tess in particular is very nifty on her pins. Right I have just found out that Compromising Miss Milton will be a May 2010 Mills & Boon Historical release. The hardback comes out in March 2010. In just seven days, she will beg for his kiss! Lydia Veratia made one mistake – and now her freedom is forfeit to the man who all Rome knows as the Sea Wolf. Sold into marriage, the one thing over which she still has control is her own desire. So when Fabius Aro offers her a wager – if she doesn’t plead for his kisses in the next seven days, then she will have her independence – Lydia thinks it will be easily won. and you can read the excerpt here. There is still no news as to when The Viking's Captive Princess will be released in the UK. As some of you know, I am a great admirer of Blake Snyder's Save The Cat! Anne McAllister introduced me to his work, and it was clear that here was a man who knew what he was talking about and was very generously prepared to share. Unfortunately Blake Snyder died on 4 August of a cardiac arrest and the world is a poorer place. I have used (and will continue to use) his beat sheet. It really does help with the plotting. Although my Story Board has some modifications from his model, it has proved a useful way to rapidly see my problems with a story. I loved his easy to remember mantras. The whole Save the Cat! saved me when I came to do revisions for The Viking's Captive Princess. Suddenly it was clear what the problem was and how it could be solved. He was absolutely generous with his time and made it a point to answer any email. I loved his blog as it always made me think, even though it was aimed at screenwriters and would be screenwriters rather than novelists. The principles still worked. I know he was working on other books about screenwriting, including one on the romance genre. It is unfortunate that these will not be finished. (Hint it would be great if they could be -- somehow) However, his influence will live on. He will remain a presence in many writers' lives. If you write commercial fiction I do recommend reading and absorbing Save the Cat and Save the Cat Goes to the Movies. His ideas are timeless. There are three new hens in the garden. Two Marans and one CBT. Now the farm labourer at Haydon Bridge Hens called it a Canadian Blacktail but the only reference I can find on the web is to a Columbian Blacktail which is a hybrid between Rhode Island red and Light Sussex plus some other hardy birds. Waitrose sells a lot of CBT eggs. So whether this is the same bard or a similar cross I can't tell but it is pretty. The hens are generally just known by their breed so it makes it easier not o be attached to them. They seem to be settling in well, but it remains to be seen if the old French Maran does her usual trick of guarding the hen house and forcing the hens to have alternate roosts. This in turn forces me and my eldest to pluck various sleeping hens off hedges and low growing branches and put them in the hen house. After about a week of the game, the Maran tires and the hens become one flock. According to the Telegraph, Fortnums has installed several very posh beehives on the top of their store. They have kept bees since 2006, but this is the frist year, they have had had them installed on the top of the store. They are charging £10 per half pound jar. There is a waiting list. I suspect the honey will be excellent (not because of the beehive) but because they are in a mixed flower area with lots of flowering trees. There is also a webcam so you can observe the comings and goings of the bees. They are using Greek bees which are very non aggressive. Greek bees tend to be good producers of honey. At the moment there is a move back toward the native English black bee as being more ecologically sound but personally I have no problem with Greek bees as that is what is we had for awhile. The main thing is to get non aggressive bees. Luckily, my current hive is beautifully tempered, despite the run in with the puppies earlier this summer. Unfortunately, I do not think I will be getting any honey this summer as the hive was only installed at the end of June and July was a very patchy month weather wise. The colony though is doing well and I saw the queen bee on Sunday. She has a bright yellow spot. 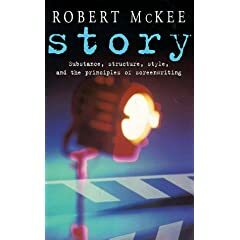 I happened to be re-reading Robert McKee Story over the past week or so. It is one of those craft books that bears re-reading and re-absorbing and I came across the statement craft is more than mechanics. It struck a chord. Writing craft is not just about the tools you use to make a story good but how you apply those tools. Some authors can use a blunt instrument and wring every ounce out of the story. Others use very fine tools and slip up because their sense of proportion and balance is wrong. Still others will use what seems to be the wrong tool and produce an absolute masterpiece. Whether they can do this consistently or not is a matter of conjecture and debate. Think for example of a hand knit sweater -- same pattern, needles, and yarn and yet it can does take on the shape and personality of knitter. Sometimes there is a dropped stitch or the tension is not right. Sometimes, it languishes in the bottom of drawer for ages, and sometimes the pattern is incomplete. Knowledge of craft never diminishes creativity. It enhances it. In other words, you need to learn the how and why, and how you apply the tools. And sometimes pure nerve and determination can carry it off. But it works far better when you understand the principles behind it. Because writing is a medium that can never fully be mastered, there are opportunities to grow and expand your skill. The other question which can be debated is can craft be taught. There is not an easy answer. You can show the skills, You can explain but whether or not the other person is listening or can apply the knowledge is open to debate. It takes a long time and patience to hone skills. The whole 10,000 hours bit. And with authors sometimes there can be a grass is greener or a tendency to want to run before they can walk. Why isn't everything happening to me now? Actually the reason why first book mega sellers hit the news is that they are NEWS. They are rare and generally unanticipated. Anyway, I generally discover a craft book around this time. 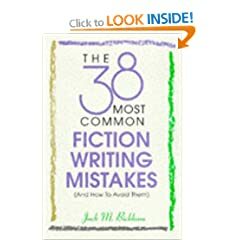 This year, Trish Wylie inspired me to get The 38 Most Common Fiction Writing Mistakes and how to avoid them by Jack M Bickham. I will admit to having read his stuff many years ago. I preferred Swain. However, the first chapter has a hit chord -- the number one mistake fiction writers make is to make excuses why they can't write. I have been there and done it. I will probably do it again. Right now though it is about showing up and writing. If you want to understand more see Trish's blog. One of the ducks had been crafty and had her nest in the greenhouse. This was well and good and possibly a sensible place to have a nest. However, there was some used netting and seven of the ducklings ended up getting stuck in the netting. We saw the mother duck with one duckling and were surprised as she is not a notoriously bad sitter. Luckily my youngest and went discovered the other ducklings. We then moved the ducklings over to the duck pen. They are currently occupying the apex house. The other mother duck with her one remaining duckling has taken over the oldest duck house and the remaining ducks, deciding not to deal with enraged mothers are all crammed into the middle house. I was so very proud of Tess and Hardy last night. They have started to help round up the ducks at night. Help is probably debatable as they have a tendency to suddenly dart forward into flock, scattering the ducks. Tess and Hardy think it is a great game. However, last night, they did seem to get the idea. They also started working as a team. Hardy went and sat on the bridge to prevent escape and then Tess went around the back of the pen on the outside. The older ducks (the ducklings and mother ducks having been good little ducks and in bed) decided it was time to playing samba samba aye aye aye we are late night party ducks and go to bed. The puppies then did a celebratory race around the houses. Today I have to start the first book in my proposed trilogy. I know where I want the books to end up. It is a question of getting them there. Who has all the shoes? Is it a female thing? Tess seems to be obsessed with my shoes. In her latest manifestation, she went and collected as many shoes of mine as she possibly could and sat with them on her bed. She did not chew them. She simply sat them with them. Hardy on the other hand, quite likes to think of himself as human and could not understand why he was not fed at the table outside.